Over the past two months or so, Mahmoud Ahmadinejad, the newly elected president of Iran, has made his mark on the world stage… to overwhelmingly bad reviews. Observations like: Israel should be wiped off the map; Israel should be moved to Europe; Europe supported the founding of Israel because of Holocaust guilt; and the Holocaust is a myth have been vehemently condemned. This is the same Paul Martin, by the way, who last month asserted: “Israel’s values are Canada’s values.” Good Gawd! What better proof is there that Canada’s Foreign Ministry is under Zionist occupation! First of all, we should ask: “Should Israel be on the map in the first place?” Loyal readers of this space know the answer, but for the rest of you, here’s the Reader’s Digest version. First, the Nov. 29, 1947, “Partition Plan” (UN General Assembly Resolution 181) was never ratified by the Security Council, and thus any division of Palestine into Jewish and non-Jewish areas was never legal. Moreover, a UNGA Resolution is only binding if all parties to it agree to be bound by its terms, which in this case did not happen. Second, the General Assembly had no right under the UN Charter to take land from one people (Arabs) and give it to another people (European Jews). Three, David ben Gurion declared Israeli statehood on May 15, 1948, even though the term of UNGA Res. 181 had not expired. Therefore, the creation of Israel was a land grab contrary to the UN and international law. Four, Israel was admitted to the UN on May 11, 1949, only after it agreed to sign UNGA Res. 273, by which it recognized the right of all Palestinians to return to their homes and receive compensation. Israel is a criminal entity that has never had a moral, legal or political right to exist. Score one for Ahmadinejad. Why indeed? Since the EuroJews who created “Israel” came mostly from Slavic countries, it does seem logical to move the “Jewish State” to Ukraine, Poland, Russia or Byelorus. That’s two for the plucky president! In fact, Western European governments were largely against the creation of Israel, but pro-Israel U.S. senators threatened to withhold Marshall Plan reconstruction aid if they didn’t support UNGA Res. 181. Guilt was doubtless rife throughout Europe, but blackmail was a bigger reason. Since guilt did play some role, I’ll give Ahmadinejad credit for this one. The Holocaust has been so polluted by propaganda that it’s virtually impossible to separate fact from disinformation, so I cannot say for certain if Ahmadinejad is right. For its part, the International Committee of the Red Cross published a three-volume report in 1948 in which it found no evidence of systematic genocide. On the other hand, estimates of Jewish deaths range from 470,000 to 9 million! 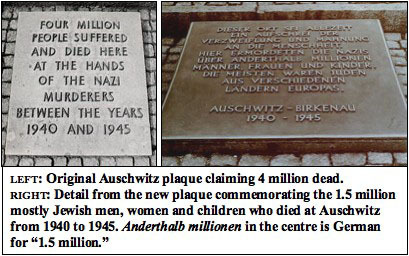 Also, the new plaque at the entrance to Auschwitz reflects the Polish government’s revision of the number of dead from 4 million to 1.5 million. The 4 million figure came from Capt. Rudolph Höss, the camp commandant, whose testimony has been discredited. Despite the reduction of 2.5 million, the Zionist figure of 6 million is still maintained. Clearly, this number is pure myth, and Ahmadinejad is at least partly right. Final score: 3.5 out of 4. Excellent! It seems honesty and courage are Iranian values. Too bad they aren’t Canadian, eh Mr. Martin?